This is an incredible life sized child manikin that sits 48” tall. 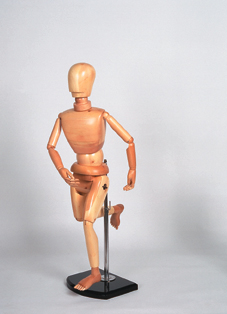 It is a handmade manikin constructed from high quality and durable hardwood. Adjustable to any position that you choose, this manikin is perfect for learning art instruction and drawing human figures. The perfect choice for an art classroom, this manikin is large enough to be seen by a classroom. Adjustable into a wide range of different positions, and it comes on a stand. This model ships by truck because of the large size and shipping is extra. It is an incredible tool for art instruction or for professional artists, and it will last for years with proper care.